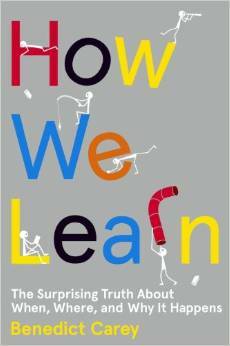 I just finished reading How We Learn: The Surprising Truth About When, Where, and Why It Happens by Benedict Carey, 2014. From a musician’s perspective, it has obvious applications for practice. In my work with music students, I have found that the best practice techniques are the ones that are unusual or humorous. For more on this topic, please check out my posts “Articulation Game,” “Rhythm Silliness,” and “Practicing Upside Down.” But I’m getting ahead of myself. The book begins with a discussion of how we learn at the neurological level. As scientific study of the brain is aided by new methods, our understanding of memory is deepened. Author Benedict Carey delves into new research on how the brain makes and stores memories. It appears that there are two sides to memory: storage and retrieval. While the brain has plenty of room to store all of our memories, not all of them can be retrieved. In order to retain information, the retrieval system must be strong. It is strengthened and made faster with use. Some of the research on how the brain learns confirms what we already know, but some is truly new and revolutionary. Practicing in frequent, short sessions is better than a single long practice. It’s more productive to have three 20 minute practice sessions than a single one hour practice. Similarly, music practice should happen everyday. Your teacher will notice if you do all of your practicing the night before the lesson because your retention of the information will be low. Testing is good for learning. Yes, you read that right. I know that there is a huge backlash against “teaching to the test,” but the testing Benedict Carey purports in this book isn’t a high-stakes national standards test. Long range studies show that frequent testing can help retain skills (p. 93). For musicians, I would like to argue that performances are “tests.” Maybe we can even think of weekly lessons as “retrieval practice.” You can create additional opportunities for performance. More ideas on finding performance opportunities can be found in the blog posts “Motivation: Parenting and Practicing” and “Motivation: A Teacher’s Perspective.” Flash cards are a proven strategy for improving memory. I have a great “Scale Game” that uses flash cards and a neat game to learn scales quickly. Take a break. The mind continues to work on problems after you have stopped actively thinking about them. Sometimes a creative solution to a problem will come to you in a flash of inspiration. However, “people don’t benefit from an incubation break unless they have reached an impasse.” (p. 128) So when you’ve worked really hard on a difficult piece of music and you’re feeling frustrated, go for a bike ride, take a nap, or do some math problems. The distraction might be what you need to get unstuck. Set goals. There are many reasons to set goals – I will talk about some of those reasons in a future blog post – but for learning, goal setting is important because it focuses the mind on the problem. This book describes the goal-oriented mind as having “tuned perception.” We are better able to zero in on the solution, and block out the unimportant information, when the goal has been set and we allow for “percolation.” If your goal for the week is to fix technical problems in a sonata, you may pay extra attention to the scale in the same key as the sonata or spend more time on a technical exercise related to the same difficulties. Vary your practice. Several studies have shown that motor skills are enhanced by practicing an activity many different ways. Not only will the skill be learned better but it will be able to be transferred to similar situations. It’s important also to make sure you practice different kind of exercises – scales, etudes, theory, improvisation – not just a single repertoire piece. “The mixing of items, skills, or concepts during practice, over the longer term, seems to help us not only see the distinctions between them but also to achieve a clearer grasp of each one individually. The hardest part is abandoning our primal faith in repetition.” (p. 164) My blog posts “Woodshedding: Grouping Game” and “Rhythm Spinner” offer some suggestions to help you vary your practice. Get plenty of sleep. We’ve only begun to understand how important sleep is to learning and future research will undoubtedly uncover more insights on the different stages of sleep, but scientists know that rest is important. Benedict Carey says, “I think of sleep as learning with my eyes closed.” (p. 212) Naps are showing promise in memory consolidation and integration. Just as eating a balanced diet will keep your body healthy, getting ample sleep is good for your brain. What does research say about memorization? How We Learn also looks at research on memorization. Granted, the scientists who create these experiments are asking subjects to memorize words, but I think that it is equally applicable to memorizing music. Psychologist Arthur Gates has spent his career trying to discover a good rule for the most efficient way to memorize. He asked the question how much time should be spent studying and how much time should be spent reciting? He found that the best ratio was 1/3 time studying and 2/3 time reciting. [Arthur I. Gates Repetition as a Factor in Memorizing (New York: The Science Press, 1917).] So, if you are trying to memorize a piece of music, play it with the music once and then twice trying to remember it without looking at the music. I’ll have more to say about this and the three types of memory in a future blog post. It will take me time to integrate all of the information in How We Learn, but I find it seeping into my teaching already. At lessons this afternoon, I suggested that a student vary her practice routine in advance of a big performance. A seed is planted. I’m curious how it will grow.